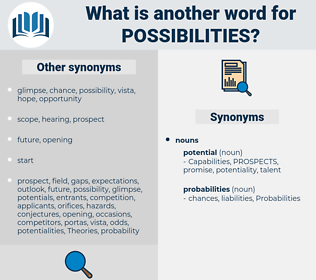 What is another word for Possibilities? Intentions, expectations, perspectives, outlooks, insights, openings, oportunidades. secretary-general, power, development, openings, participation, oportunidades, atlantic, board, e., agriculture, avenues, Programs, framework, deal, possible. possibly, Abilities, circumstances, Capacities, Risks, priorities, responsibilities, conditions, factors, Suggestions, implications, positions, flexibilities, modalities, Intentions, proposals, explanations, dangers, promises, expectations, practicalities, allows, threats, ways, Diversities, considerations, Facilities, times, techniques, presumptions, odds, propositions, steps, interests, Activities, points, effects, situations, terms, benefits, principle, enables, Allowed, opportunites, perspectives, Ideas, provisions, prerequisites, allow, characteristics, powers, concerns, tools, concepts, IMPACTS, occasions, outcomes, locations, preconditions, elements, logistics, partnerships, WINDOWS, developments, Faculties, restrictions, methods, instances, Permits, Visions, savings, objectives, select, supplies, Theories, bids, bridges, limitations, moyens, gates, grounds, frontiers, types, aspects, viewpoints, Rights, appears, hazards, plans, premises, sites, access, occurrences, channels, proceedings, Contingencies, initiatives, offerings, source, sources, substitutes, limits, groups, 'affaires, settings, things, strategies, perspectivas, heights, Measures, constraints, Efforts, others, skills, fields, forecasts, insights, offers, assets, variations, opinions, courses, submissions, Paths, allowances, Creating, coordinating, voies, mechanisms, utmost, layers, components, formulations, provides, competences, responses, outlets, fully, Resources, roads, Ones, pledges, differences, commitments, waterways, methodologies, dimensions, inputs, Promoting, clues, scripts, arrangements, pleas, cooperation, sorts, views, arguments, example, examples, actions, systems, Orientations, horizons, easy, routes, applications, qualifications, contexts, issues, values, spheres, modes, corridors, devices, respects, Vistas, procedures, challenges, passages, directors, quotas, processes, Roles, patterns, networks, appliances, hands, Researchers, strengths, counterparts, affairs, merits, functions, quotations, Undertakings, shapes, Voices, leads, Schools, encourage, sidelines, tenders, levels, venues, approaches, quotes, directions, trails, markets, contracts, centres, Motions, results, schemes, fringes, balances, pistes, Remedies, places, Forums, instruments, gaps, media, Mediums, manners, colleges, spaces, kinds, binaries, ratings, how, features, margins, funds, references, Vehicles, promote, shares, Angles, experiences, streams, frames, measurement, backgrounds, FORMATS, Tracks, cases, practices, models, highways, domains, driveways, Forms, programmes, Foundations, runs, exchanges, needs, airways, LANES, answers, returns, deals, runways, guys, Formulas, departments, dates, hard, figure, LINEs, openings, Areas, avenues, Programs. allows, enables, means, offers, needs, possible. Capabilities, opportunity, Opportunities, Areas, potential, potentials, probability, Probabilities, feasibility. 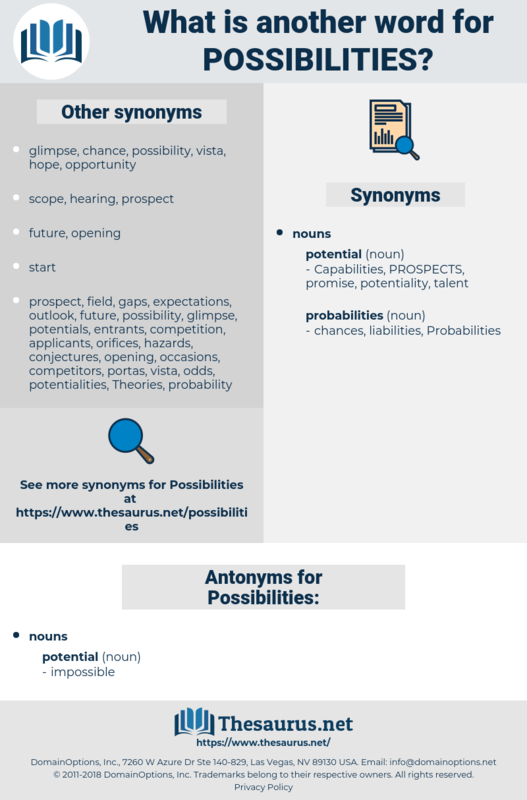 Hypotheses, Availabilities, Eventualities, scenarios, solutions, future, advantages, choices, means, PATHWAYS, doors, competencies, Capabilities, opportunity, Opportunities, potential, potentials, Probabilities. I see great possibilities ahead of us. Do you think the education of happiness is the education most likely to bring out the greatest possibilities of the soul?